Just in time for Cinco de Mayo, and of course, your weekend snacking, we’re serving up some Loaded Vegetarian Nachos! They’re hearty, spicy and full of fibre and healthy fats! If you’re anything like my husband, you’re going to be a bit skeptical as I start to describe these nachos. That’s because they aren’t vegetarian in the sense that they’re loaded with lots of lentils, black beans or chick peas (although that would be super delicious too!). No, these nachos are actually loaded with a walnut/mushroom mixture that resembles the taste and texture of ground beef. Seriously, I was even skeptical as I set out to make these, but I was pleasantly surprised by how delicious and convincing walnuts and mushrooms can be as taco meat. And fyi, my husband was sold on it too! While I would love to take credit for this genius and delicious idea, faux taco meat is not a new idea. If you search Google or Pinterest, you will find all sorts of recipes for vegetarian taco meat. In fact, the recipe I’m sharing today was actually inspired by Pinch of Yum’s recipe for Cauliflower Walnut Taco Meat, which has cauliflower and walnuts as its base (obviously) and is absolutely delicious! Unfortunately, when I got a craving for nachos last week, I didn’t have any cauliflower. And truth be told, after eating cauli pizza crust and cauli rice the week before, I had my fill of cauliflower. I did, however, have a package of cremini mushrooms that were calling out to be used (which actually means they were a day away from being thrown out). So I chopped them up and threw them in the food processor with some walnuts, and after a few pulses, the mixture actually resembled ground beef. Texture is one thing, but what about taste? Well, that’s where some trusty spices, lime juice, red onion and jalapeño pepper come into play. Just add these ingredients to your skillet with the walnut/mushroom mixture and cook it for a few minutes until the onions and peppers soften. The result is a pretty convincing and tasty vegetarian taco meat that’s perfect for nachos. You can even add it to salads, wraps, or tacos. I’ve tried them all in the last week! This mixture makes an awesome topping on a bed of greens with some guacamole and tomatoes. If you’re not into nachos, then you definitely need to try this mixture in a taco salad! Vegetarian taco meat. To avoid mushy taco meat, try not to cut your mushrooms too small or over-process the walnut/mushroom mixture. Choose your toppings. For these nachos, I used red and green pepper, roasted corn and tex mex cheese. But you can add anything you like! Green onions, tomatoes or black beans would also work really well. Tortilla chips. You can go a few different ways here. Store-bought is obviously the easiest, and although they aren’t typically clean eating, if you’re in a rush, just go for it. I do this sometimes, especially when I’m serving a crowd. But if I’m making these for myself and hubby, I usually make Sea Salt Lime Tortilla Chips, which are just corn tortillas baked with a little bit of evoo, lime juice, sea salt and pepper. Nachos two ways. The first time I made these, I layered the corn tortilla chips in the skillet and loaded on the taco meat, veggies and cheese (see pics above and below). I love my nachos this way, but if you’re using the homemade tortilla chips they can get a bit chewy under all the toppings. So the second time I made these, I baked the taco meat and toppings on their own and then used the chips to scoop out the mixture. Either way works great, it just depends on your preference, and whether you use store-bought or homemade corn tortilla chips. 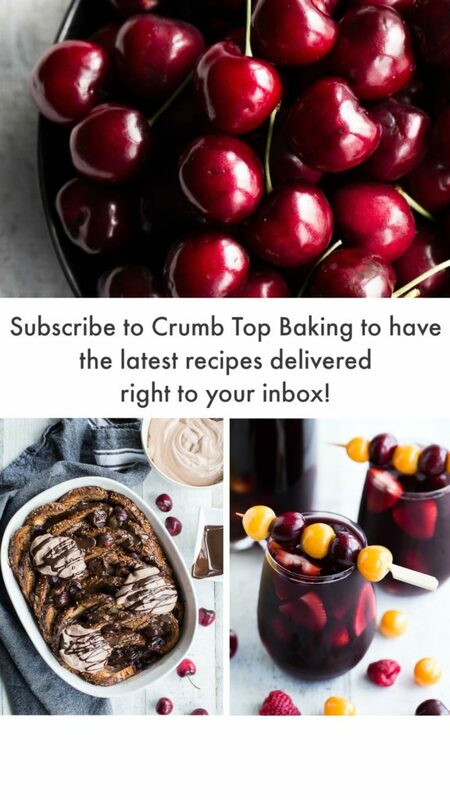 If you make these, I would love to hear about it in the comments below, or take a pic and tag @crumbtopbaking on Instagram. And if you’re looking for some other recipes featuring nachos, be sure to check out these Pork Carnita Breakfast Nachos! Perfect for Cinco de Mayo or Mother’s Day brunch! These Loaded Vegetarian Nachos are made with a blend of walnuts, mushrooms, veggies and spices. So they’re hearty and flavourful, but also full of fibre and healthy fats. Perfect for weekend snacking or a get together with friends! Pre-heat the oven to 400 degrees and line a baking sheet with parchment paper. Add the oil to a cast iron skillet and pre-heat on low on the stove top. 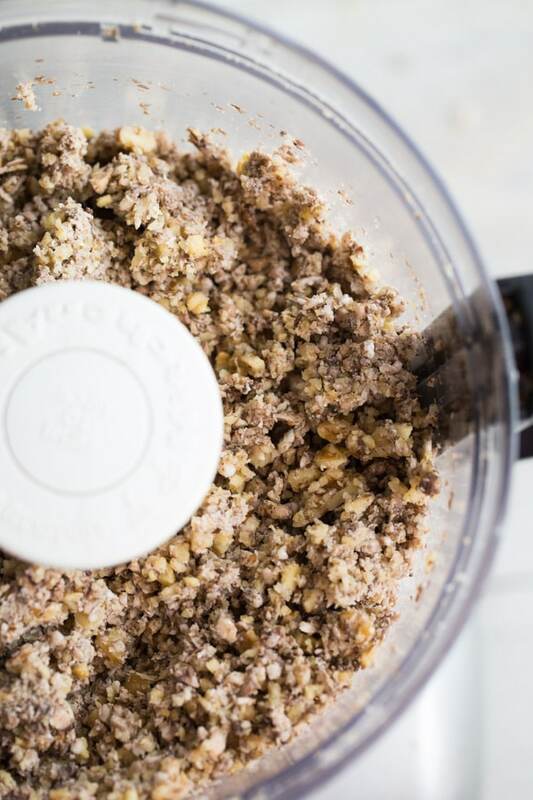 Add the walnuts and mushrooms to a food processor and pulse a few times until the mixture is crumbly. Add the walnut/mushroom mixture to the pre-heated skillet and add the chopped onion, jalapeño pepper, lime juice, chili powder, smoked paprika, cumin, salt, garlic powder and crushed chipotle peppers. Cook on low until the onions and peppers have softened (about 10 minutes). Remove from heat. 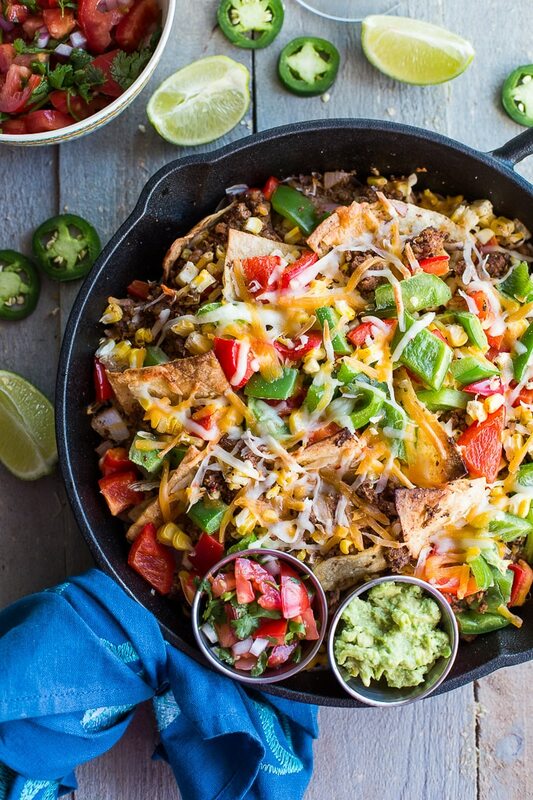 If you’re using store-bought tortilla chips, spread them out on the prepared baking sheet (or in another skillet), and top with the taco meat, red and green peppers, corn and cheese (and other toppings as desired). Bake in the pre-heated oven for 10 minutes, or until the mixture is heated through and the cheese has melted. 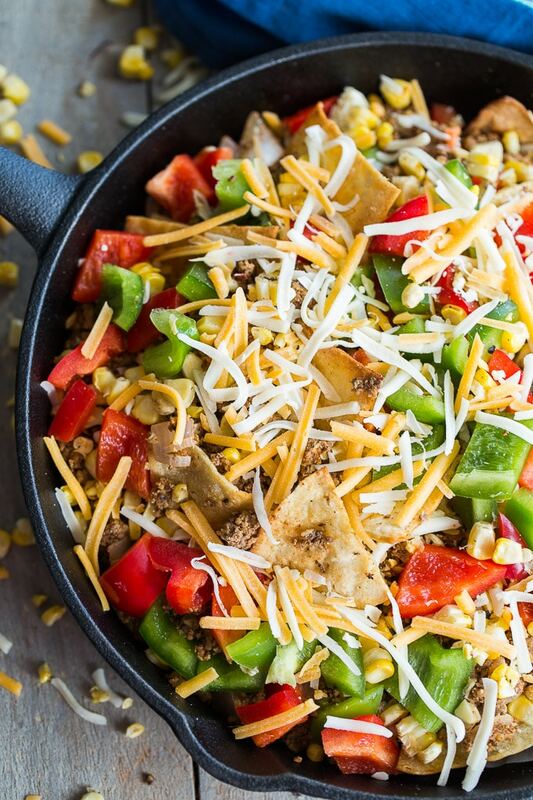 If using homemade tortilla chips, leave the taco meat in the skillet and top with the veggies and cheese. Bake in pre-heated oven for about 10 minutes, or until the cheese has melted. Remove from oven and stick the tortilla chips into the nacho mixture and serve! You can either use store-bought tortilla chips or make these Sea Salt Lime Tortilla Chips. If you decide on the homemade chips, I would definitely double the recipe. I roasted two ears of fresh corn for these nachos, but you can also use canned corn. If you want to use roasted corn, just brush some oil on the corn and season with salt and pepper. Roast for approximately 40 minutes on 350 degrees. Once cooked and cooled, just cut the corn kernels off the cob. To avoid mushy vegetarian taco meat, try not to chop your mushrooms too small or over-process the walnut/mushroom mixture. The time to prepare this recipe does not include the time to make the corn tortilla chips or roast the corn. 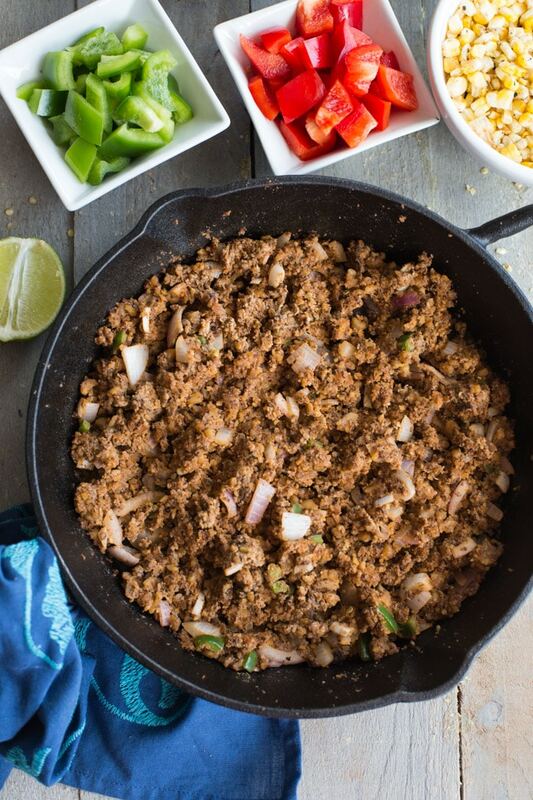 This recipe was inspired by Pinch of Yum’s Cauliflower Walnut Taco Meat. These are definitely a new favourite in our house, especially for Friday nights with a beverage! 😉 As for breakfast, if you throw some eggs on there, I think these are totally appropriate for an early morning meal! I’ve never heard of a mushroom nut mix to replace meat but I love both on their own. I’m definitely going to try this as I like to minimize how much meat I eat but I don’t want to sacrifice taste. Thanks Ayngelina! You definitely won’t be sacrificing taste! Let me know if you try it. Would love to know what you think! These look amazing, Leanne! And anytime is can sneak in some extra mushrooms!!! Thanks Lisa! Lots of mushrooms in this one! Hope you’re having a great week! These look delicious Leanne! I must admit I have also been having a little too much cauliflower everything lately and mushrooms seem like the perfect fit! I haven’t had nachos is forever because cheese and me aren’t friends but you have inspired me to do loaded nachos sans cheese! So excited to try it! Thanks Lizzy! Can’t wait to hear what you think! The mushrooms work really well in the taco meat, and I didn’t add too much cheese, as we’re not always friends either! I love these smothered in guacamole so you could totally get away with no cheese! Have a great week! GAH! These look amazing! I’m such a sucker for a good nacho platter and it’s great to have such a hearty vegetarian option. 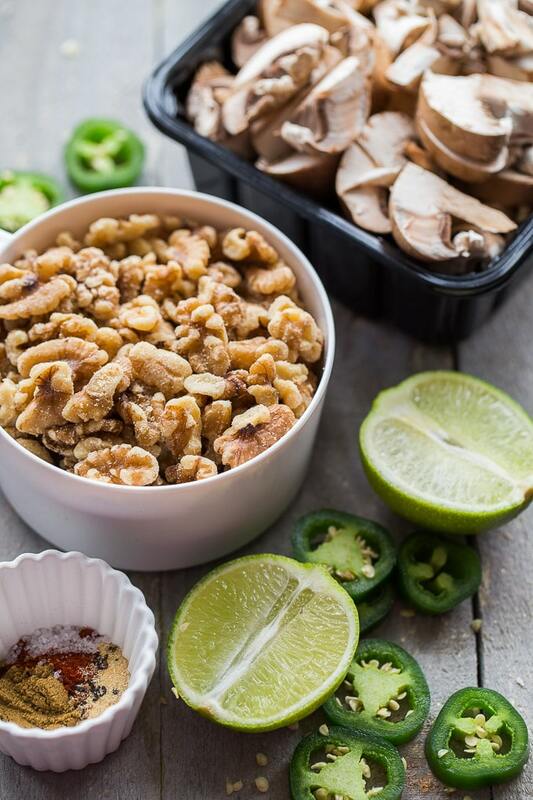 I love love love the use of walnuts! I’ve used them in vegetarian burger patties before and they are some kind of magic. Amazing recipe, Leanne! Thanks so much Dana! 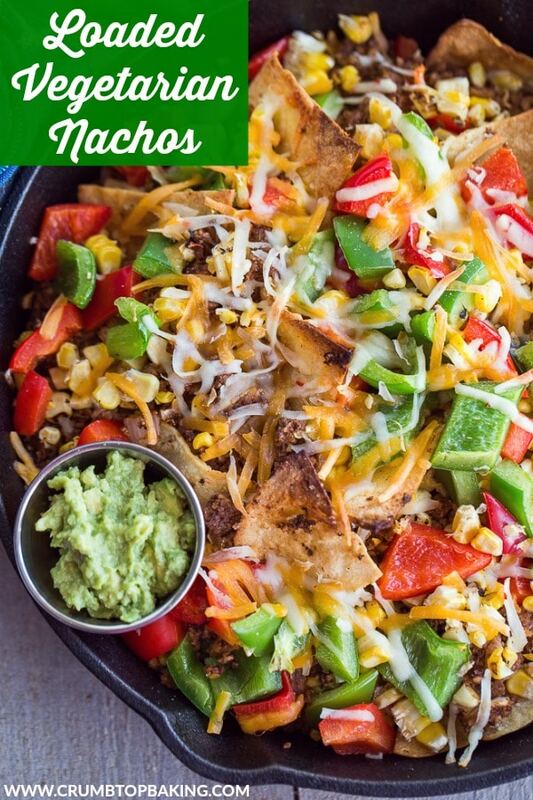 I’m a sucker for nachos too, so the healthier I can make them, the better! I’ve never tried walnuts in burger patties. I’m definitely adding that to the must-try list! Thanks for the idea! Love this faux meat mix. Walnuts are so versatile, and so heart-healthy too! And who wouldn’t want to dip right into this loaded pan of veggies! Thanks Elaine! Walnuts are definitely versatile. I add them to salads and granola bowls all the time! As for the veggies, I love piling them on my nachos! The mix of flavour and colour gets me every time! I want this all up in my face… now! I was surprised how much mixed up walnuts and mushrooms resemble ground beef! I’m cutting out carbs for awhile so when I make this recipe, I’ll take out the chips but the other flavors look on fleek lady!!! P.S. I’m 40. Can I say “on fleek” at this age? Haha! You’re too funny Christina! I’m also 40 but I had to google to find out what “on fleek” meant. You’re probably just hipper than I am! 😉 As for these nachos, I totally get minimizing carbs. I’ve actually been using the veggie taco meat as a salad topping, and it’s quite tasty. It’s worth a try for sure! With roasted corn, chipotle and jalapeño peppers etc these nachos must be bursting with flavour and tingling your taste buds. I love your choice of ingredients that you have put in this recipe. I have bookmarked it so will soon be making it and tagging you. thanks so much! oh, shoots, I forgot to give you star rating and you deserve all 5 stars! Thanks so much Fouzia! The nachos are definitely flavourful, but not too spicy. Would love to know what you think if you make them! Leanne, these look amazing! I love that you used walnuts and mushrooms, such a perfect meat alternative with all of the healthy fats and protein. These nachos look delectable. Thanks so much Colleen! These are definitely filling, and a healthier version that traditional beef nachos! I’m looking forward to making them again. Happy Wednesday! Loving all the spice and color here! This will be one treat for Cinco de Mayo that won’t stand a chance!! Delish! Thanks Annie! These nachos are definitely on the menu for our Cinco de Mayo celebration! Hope you’re having a great week! I love all the different colours and flavours of this nachos dish! The walnuts and mushrooms are a brilliant substitution for meat! Beautiful dish! Your singing my tune! 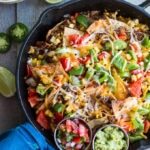 I have had a nacho craving lately and I love this vegetarian version. I hear you on the cauliflower, I use it a lot to but sometimes need a new alternative. These look wonderful and dare I say better than the original version 🙂 . Take care. Thanks so much Stacey! These should definitely satisfy your nacho craving! I can’t wait to make them again on Saturday. Hope you’re having a great week! You KNOW I’m making these this weekend! But I’ll probably need to practice several times during the week so I get them perfect on the 5th :). SO GOOD! Nachos are one of my very favorites! Haha! Practice makes perfect! Thanks Kelsie! I hope you like them. We will be making them again this weekend too! I have a Cinco de Mayo party every year and am always at my wit’s end trying to come up with something delicious and suitable for my vegetarian friends – this seems like the perfect solution! Thanks for sharing. Thanks Yvonne! A Cinco de Mayo party sounds like a lot of fun! If you end up making these nachos, I would love to get your feedback! Enjoy! I know faux meat isn’t a new concept but I haven’t ever tried it! I’m glad you reminded me because I’m getting all kinds of sneaky ideas on how I can incorporate this into our meals and see if my kids notice. 🙂 These nachos look amazing Leanne — they’re one of my biggest weaknesses! Thanks Marcie! It’s definitely worth a try, and I’d be curious to know if your kids notice the difference! And I’m with you – nachos are a weakness of mine too! I remember drooling over these on Instagram the other night and am still drooling. Your seasoning looks spot on, it’s no wonder you and your husband gobbled these up. Thanks for sharing, Leanne! Haha! Thanks Nicole! The seasoning works really well in disguising the taste of the mushrooms and walnuts! We’ll definitely be making these again this weekend! You’ve totally peaked my interest with these nachos Leanne! They look totally amazing! Your photos are leaving me drooling and VERY hungry! Sounds delicious! I’ll have to add this walnut/mushroom combo to my meatless Monday rotation! Thanks Melissa! It’s definitely a great addition to meatless Monday! Let me know what you think if you make them! Interesting combination for the faux beef recipe. Huh… I am going to have to give that a try. One thing that can be really great about Mexican cuisine and vegetarianism is that the flavors can help mask up some of the faux beef. NOT that the ingredients aren’t good on their own, but it can be a bit hard to make something that REALLY tastes like ground beef. Even the store-bought stuff, I tend to like getting the ‘fiesty’ varieties, as they just taste better IMO. And nachos? There are so many other components that make it taste SO good that the beef tends to take a back seat anyway to all the other flavors. This Nacho dish looks great. Thanks Ben! You’re right. The seasoning is definitely what makes this combo work as faux taco meat. The jalapeños and red onion do a great job in helping to disguise the taste of the walnuts and mushrooms. Hope you get a chance to give these nachos a try! These looks amazing! The combination of the walnuts and mushrooms! DA BOMB! Even better that this is all homemade. Can’t wait to whip up a batch of these! Thanks so much Lily! Be sure to let me know what you think if you make them! I’m not a nachos expert (We extremely rarely have it, perhaps once or twice a year), but this skillet sounds looks fantastic! I’m a huge fan of the mushroom-walnut combo, so I’m totally in! Thanks Ben! Nachos are a treat for us, but I think we’ll be eating them a lot more now that my husband is onboard with this vegetarian taco meat! Enjoy the rest of your week! I love that you found a resources and fun way to use those mushrooms! Lots of times the best ideas come out of necessity (or scrounging in the cupboard). The nachos look amazing and you would be hard pressed to find anyone who could resist them. Thanks so much! It’s so true. Sometimes the best recipe ideas come when you have limited ingredients. And besides, the mushrooms work really well in this recipe! Happy Wednesday! 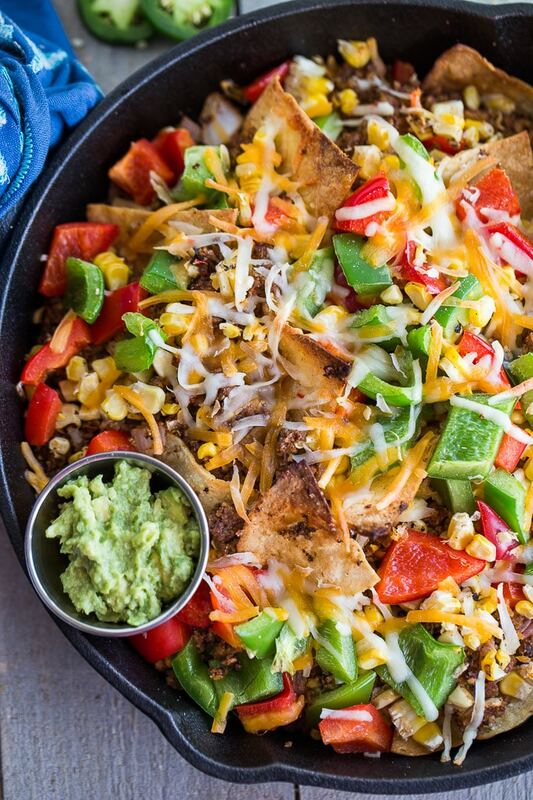 Veggies nachos are my go-to. Hope you like them Codrut! These look so amazing Leanne! I want these like now!! YUM! Thanks Kim! They make a great weekend snack!